Hearty Tomato Beef Stew. Ground beef with onions, garlic, carrots, celery and fennel seeds in a rich tomato-based broth. 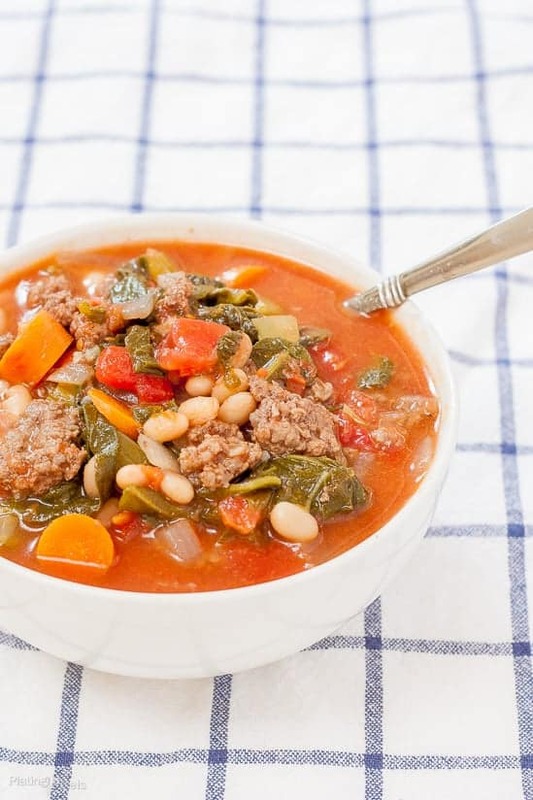 Hearty and healthy gluten-free soup. Soups and stews are recipes that always sound good, yet I make them far too little. This changes now. I mean, look at this Hearty Tomato Beef Stew, how could you not? Maybe it’s my impression that soups take lot of obscure ingredients or time to make. However, one shoe does not fit all. If you want quick and simple stew or soup that’s doable too. At around 10 common pantry ingredients and 30 minutes total, we have a winner here. Fennel seeds are the main ingredient that give Italian sausage its unique flavor. This is my preferred choice when making lasagnas, spaghetti or any Italian dish with meat. If you don’t have any sausage on hand, or want to use more affordable beef instead, add some fennel seeds. 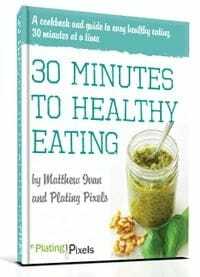 About 1–2 teaspoons per pound is all you need. Add it while you are cooking the beef, this is enough to add flavor this entire stew recipe. 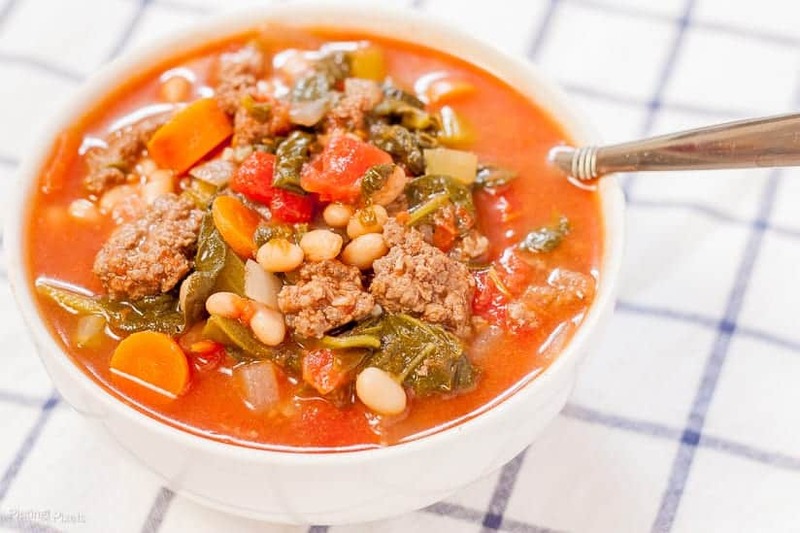 The secret to adding a good depth of flavor to soups and stews is to saute the veggies and meat. 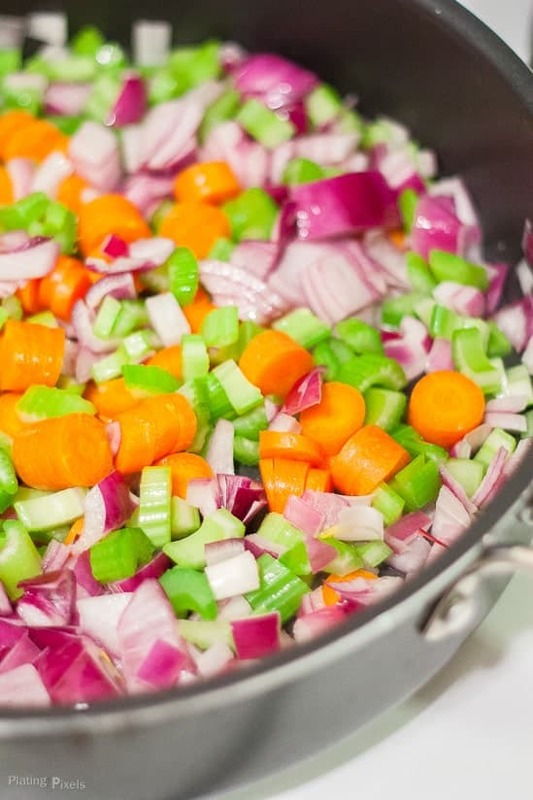 By sauteing the vegetables first you release a ton of flavor before the liquid is added which will then develop when simmered. If you simply add the vegetables or meat straight into the liquid they’ll just boil and the depth of flavor just won’t be there so it’s an important step! This beef stew is full of nutritious and wholesome ingredients. 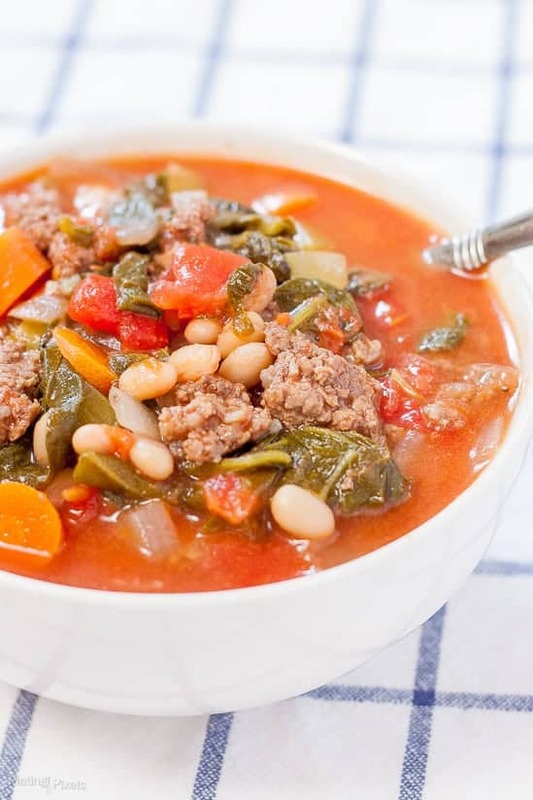 There’s plenty of fiber from the beans, protein for the beef and a ton of vitamins and minerals packed into the delicious vegetables such as iron and vitamin C.
Pour diced tomatoes, beans and chicken stock into a large pot or Dutch oven, simmer. Meanwhile: Add onions and garlic to a large pan. Cook, stirring occasionally, until fragrant. Add ground beef. Stir and break up meat as it cooks until just browned. Stir in carrots, celery, salt, pepper and fennel seeds. Cook until vegetables are slightly softened and meat is cooked through. Pour beef and vegetables into pot of liquid. Stir in spinach and basil. Simmer to let flavors meld together. The veggies soften and the broth thickens up as it cooks longer. Add more salt and pepper to taste if desired. 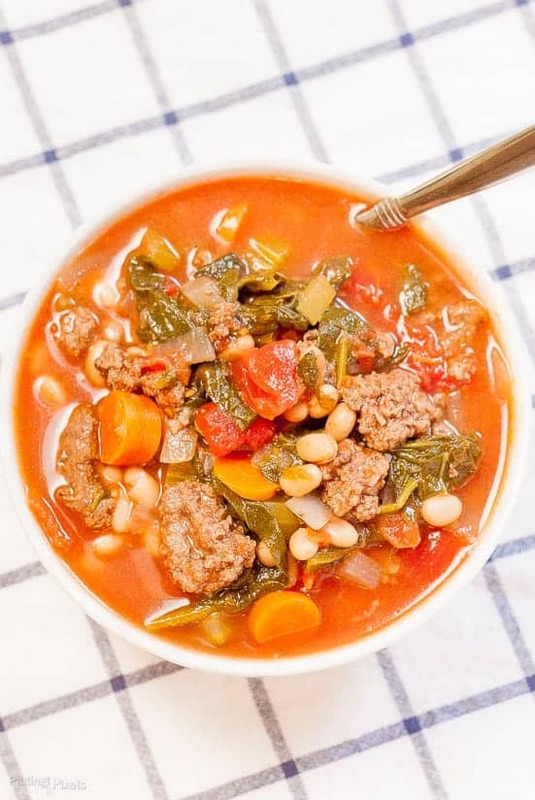 Since you can make this in under 30 minutes, it’d be hard to find a reason not to make and enjoy this wonderful, gluten-free stew recipe. If you’re vegetarian or vegan, omit the ground beef and use vegetable stock. This tomato stew is like most soups and stews tastes even better the next day. The flavors really get time to develop and become extra delicious so if you have leftovers you can easily re-heat and enjoy it for lunch or dinner. If you’re not planning on eating the leftovers the next day then you can store the stew in the fridge for up to 3 days or freeze in suitable containers. 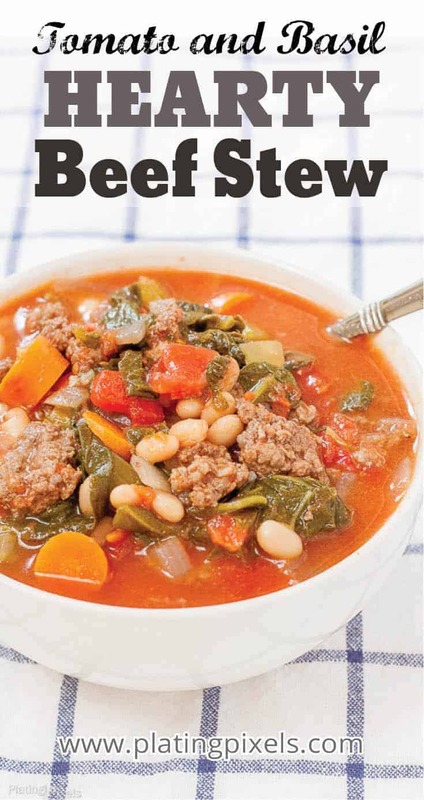 Ground beef with onions, garlic, carrots, celery and fennel seed in a rich tomato-based broth. Healthy gluten-free soup. Pour entire cans of diced tomatoes, beans and chicken stock into a large pot or Dutch oven. Heat over medium heat to a low boil, then reduce to low simmer. Meanwhile: Heat olive oil to medium-high heat in a skillet or large pan. Add onions and garlic. Cook 3-4 minutes, stirring occasionally, until fragrant. Add ground beef. Stir and break up meat as it cooks, for 5-7 minutes, or until just browned. Stir in carrots, celery, salt, pepper and fennel seeds. Cook 4-6 minutes more until vegetables are slightly softened and meat is cooked through. Pour beef and vegetables into pot of liquid. Stir in spinach and basil. Simmer uncovered for 5-20 minutes to let flavors meld together. The veggies soften and the broth thickens up as it cooks longer. Add more salt and pepper to taste if desired. This sounds so yummy and what a great way to use ground beef! They sure are. Thanks Kimberly! I love the fennel seeds in this I bet it makes it taste extra special! It totally does! I almost always use fennel seeds with meats in Italian dishes. This *almost* makes me look forward to winter! I agree as well Maria. I do love summer but also need to look into cozy and hearty recipes soon as well! Definitely sounds hearty and healthy! Hearty indeed! So many textures and flavors! Thanks Steph! Exactly, this one is a rich and flavorful soup. All over a crockpot meal right now. It is unusually hot right now in our area. That looks amazing! I could use something hearty like that in my belly, right now. Thanks April! What I like about soups is you can make so much and they’re great for leftover! Wish I had some leftover right now too!